The INFRARED IC HEATE T962 A is a micro processor controlled reflow-oven. 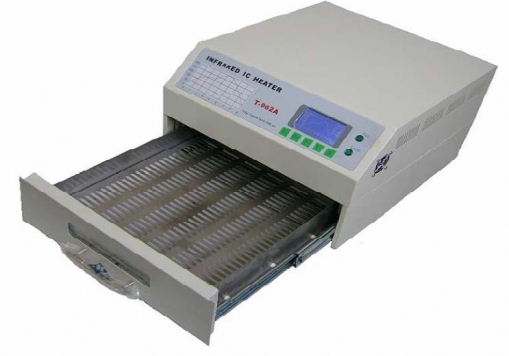 It can be used for effectively soldering various SMD and BGA components.The whole soldering process can be completed automatically and it is very easy to use, This machine uses a powerful infrared emission and circulation of the hot air flow, so the temperature is being kept very accurate and evenly distributed. A windowed drawer is designed to hold the work-piece,and allows safe soldering techniques and the manipulation of SMDBGA and other small eletronic parts mounted on a PCB assembly. The T962 may be automatically rework solder to correct bad solder joints,remove/replace bad components and complete small engineering models of prototypes. Effective soldering area:300×320mm;this increases the usage range of this machine drastically and makes it an economical investment. Parameters of eight solderng cycles are pre defined and the entire soldering process can completed automatically from Preheat,Soak and Reflow through to cool down. Uses up to 1500 Watts of energy efficient Infrared heating and air circulation to re-flow solder. Good build quality but at the same time light weight and a small footprint allows the T962 to be easily bench positioned transported or stored . The T962 can solder most boss-eyed or double-face PCB boards small parts,for example CHIP,SOP,PLCC,QFP,BGA etc.It is the ideal rework solution from single runs to on-demand small batch production.